Borhani, S. (2015). Removal of Reactive Dyes from Wastewater using Cyclodextrin Functionalized Polyacrylonitrile Nanofibrous Membranes. Journal of Textiles and Polymers, 4(1), 45-52. Sedigheh Borhani. "Removal of Reactive Dyes from Wastewater using Cyclodextrin Functionalized Polyacrylonitrile Nanofibrous Membranes". Journal of Textiles and Polymers, 4, 1, 2015, 45-52. Borhani, S. (2015). 'Removal of Reactive Dyes from Wastewater using Cyclodextrin Functionalized Polyacrylonitrile Nanofibrous Membranes', Journal of Textiles and Polymers, 4(1), pp. 45-52. Borhani, S. Removal of Reactive Dyes from Wastewater using Cyclodextrin Functionalized Polyacrylonitrile Nanofibrous Membranes. 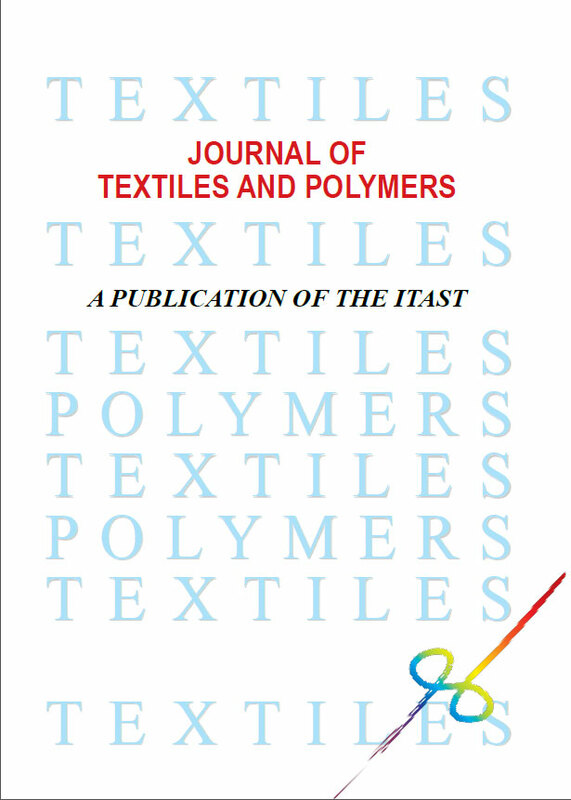 Journal of Textiles and Polymers, 2015; 4(1): 45-52. Electrospinning of nanofibers with cyclodextrin (CD) is attractive because the produced fibers can potentially increase the efficiency of nanofibrous membranes by facilitating the complex formation with organic compounds and high surface area of the nanofibers. In this work, polyacrylonitrile (PAN) nanofibers functionalized with β– cyclodextrin (βCD) during an electrospinning process were used to treat a reactive dye wastewater stream by dynamic method. It was found that the dye removal efficiency was increased from 15.5% for PAN to 24% for PAN/βCD nanofiber mats. The low efficiency of PAN/βCD membranes was due to the decrease in the βCD content during the filteration process because of the high solubility of βCD in aqueous solutions. By crosslinking βCD through a polycondensation process, the PAN nanofibrous membranes containing βCD polymer (βCDP) were prepared and used for filtration. Compared with PAN nanofibers, it was found that the dye removal efficiency improved more than two times by using PAN/βCDP nanofibers. In such circumstances, due to the decrease in the water solubility of βCDP, the βCDP content in nanofibers didn’t change during filtration; therefore, the dye removal efficiency of the PAN/βCDP nanofibers was higher than that of the PAN/βCD ones. The XRD results also showed that inclusion complexes between the βCD cavities and dye molecules were formed. Bioresource Technol., vol. 77, pp. 247-255, 2001. Bioresource Technol., vol. 97, pp. 1329-1336, 2006. Desalination, vol. 245, pp. 321-348, 2009.
nanofiltration”, Dyes Pigments, vol. 74, pp. 512-518, 2007. R. Gopal, S. Kaur, Z. Ma, C. Chan, S. Ramakrishna and T.
Matsuura, "Electrospun nanofibrous filtration membrane", J.
Membrane Sci., vol. 281, pp. 581–586, 2006. Filtration problems and solutions from tiny materials", J.
Membrane Sci., vol. 296, pp.1-8, 2007. T. Uyar, R. Havelund, Y. Nur, J. Hacaloglu, F. Besenbacher and P.
electrospun fibers", J. Membrane Sci., vol. 332, pp. 129-137, 2009. Nanotechnology, vol. 20, pp. 1-10, 2009.
membranes for protection from chemical warfare stimulants"
Nanotechnology, vol. 17, pp. 2947–2953, 2006. "Oligosaccharide Functionalized Nanofibrous Membrane", Int. J. Nanosci., vol. 5, pp. 1-11, 2006.
using electrospinning techniques", J. mater. process. tech., vol. poly(N-vinylpyrrolidone) and β- cyclodextrin", Mater. Chem. Phys., vol. 111, pp. 205–208, 2008. Cyclodextrin–Pseudopolyrotaxane Nanofibers", Angew. Chem. Int. Ed., vol. 47, pp. 9108 –9111, 2008.
functionalized polyethylene oxide (PEO) nanofibers", Eur. Polym. J., vol. 45, pp. 1032-1037, 2009.
electrospinning", Nanotechnology, vol. 20 pp. 1-14, 2009.
facilitated by cyclodextrin inclusion complexes", React. Funct. Polym., vol. 69, pp. 145–150, 2009.
organic vapors waste treatment", J. Membrane Sci., vol. 365, pp. Membrane", Curr. Nanosci., vol. 7, pp. 633-639, 2011. Woodhead publishing, Cambridge, UK: 2007, pp. 299-316.
polymer", Bioresource Technol., vol. 90, pp. 193-198, 2003.
of toxic contaminants from waste water", Cyclodextrin News, vol. crosslinked by citric acid with PEG-400 as modifier", Carbohyd. Polym., Vol. 78, pp. 125-130, 2009.